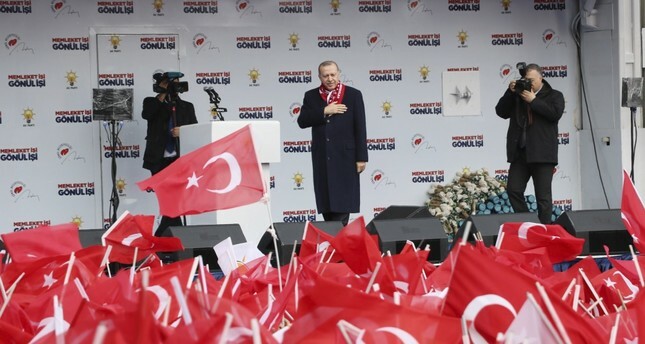 President Recep Tayyip Erdoğan, the ruling Justice and Development Party's (AK Party) acting chairman, initiated rallies for the upcoming March 31 local elections on Friday in central Sivas province, giving a glimpse of what the campaign period is going to be like. AK Party's green policy was just one of the major talking points in Erdoğan's speech, which included an agricultural transformation in favor of cannabis production and abolishing the use of plastic bags. These key topics are expected to be the main theme of the whole campaign process. He first announced that cannabis would be produced in Sivas from now on, since it will be used in various areas, from the production of undershirts to string bags. "There will no longer be plastic bags," he said, as part of the measures the party will take for its green policies. Erdoğan announced in January that Turkey would exponentially increase the production of industrial hemp. He also announced that for the campaign for the March 31 local polls, the party would use string bags made from natural materials instead of plastic ones. Talking about the benefits of using bags with natural materials, Erdoğan pointed to the fact that they can be reused as long as they are cleaned properly, preventing waste at a remarkable level. "These [natural materials] are the friends of our soil," the president emphasized. Saying that hemp was the main material of natural bags, Erdoğan said that due to previous incorrect agricultural policies in the country, hemp could no longer be produced in Turkey and had to be imported from abroad. "However, hopefully now, our Agricultural Ministry can initiate new work on this matter, and we will take the necessary steps to produce it," Erdoğan said. The president also spoke on Syria and Turkey's security concerns. Indicating that those who try to harm Turkey will have to suffer the costs, Erdoğan gave the example of Turkey's cross-border operations in Syria. "'We will foil every plot against Turkey's interests, achievements and goals," he said. The Turkish military pushed into northwest Syria in two offensives, carving out a de facto buffer zone to protect its border towns and cities, which were targeted in cross-border attacks by terrorist groups. The first operation, Euphrates Shield, in 2016, drove Daesh from territory along the border and prevented the People's Protection Units (YPG) from forming a continuous area stretching from the Iraqi border to the district of Afrin northwest of Aleppo. The second operation, Olive Branch, wrestled the nearby Afrin region from the hands of YPG terrorists this spring. Erdoğan also criticized the main opposition Republican People's Party (CHP) for cooperating with the pro-PKK Peoples' Democratic Party (HDP), saying that those who you side with define you. The CHP has stepped up its cooperation with the HDP for the March 31 local elections, although the administrations of both parties have denied forming an alliance. The HDP announced previously that it would not nominate mayoral candidates in seven major municipalities, including Istanbul, İzmir and Ankara, in the March 31 local elections. The decision raised questions about a possible secret alliance between the CHP and the HDP, despite both parties refuting claims of an alliance. The HDP's declaration to not nominate candidates in certain provinces has angered many party members in the Nation Alliance formed by the CHP and the far-right Good Party (İP). Some İP party members even resigned and joined the ranks of the AK Party. Most recently, the Mardin Public Prosecutor's Office launched an investigation yesterday into 16 suspects for spreading terrorist propaganda in a candidate presentation meeting in the province.